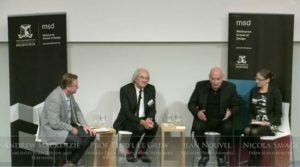 MSD Presents: Jean Nouvel – watch the interview on YouTube. Project work with the Language Services Team which aims to promote and develop interpreter and translator access for non-English speaking background (NESB) residents when accessing government services. Visit the OMAC website. French<>English Consecutive Interpreting for a lecture titled “Architecture and Non-Places” presented by Professor Marc Augé in December 2013. Professor Marc Augé is one of France’s leading public intellectuals.